Koi ponds are habitats built for those lovely fish we call “Living Jewels” and normally differs from other water garden features. When building a pond for the fist time, people new to the koi hobby will often think they are creating there dream pond, but often there are many obstacles and requirements that are often overlooked. Often the biggest mistake of a new hobbyist is to dig a hole either too small or to shallow, throw a liner, add water, add a few fish, and call it a day. Nature's Touch Ponds wants to help you get it right the first time. 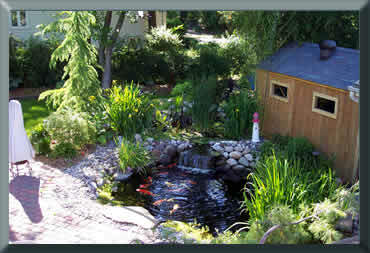 Koi ponds, when installed correctly can be a very rewarding and relaxing feature to any backyard and landscape. A proper understanding of filtration, water chemistry, plumbing, rock placement, and many other components will be needed to complete this project. Pond Design: Perhaps one the most difficult but truly critical aspects of building a pond, is to find the perfect location for it in your yard. The whole point behind this process is to find a perfect location that you can view and enjoy your pond not only when outside but while you are inside as well. Ideally, the pond will sit where we can see it from the house all year ‘round. Sometimes a patio or deck may need to remodeled or removed, and sometimes plants may need to be transplanted in the process. Deciding just where it will go and what it might look like will take some imagination but that can be helped by using a rope or garden hose or even spreading lime to outline the pond’s perimeter on the ground. Then, viewing it over several days from many angles from rooms in the house as well as from the surrounding property will help in deciding the ideal spot. Size and Shape: The size of a pond is crucial to its overall impact on the landscape and the homeowners' enjoyment. We always recommend you go as large as your property and budget allows. 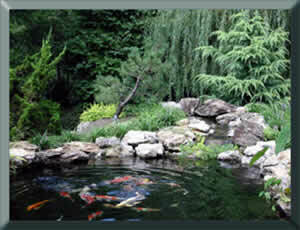 You may find yourself renovating your pond a few times if you don't go so large. It’s always cheaper and easier to build your last pond first. Sunlight and Shade: Most aquatic plants require an average of six hours of sunlight per day to achieve their full beauty. If your pond will receive less than four hours per day of sunlight then you will be limited on the number and types of aquatic plants. More shade does have its benefits though, you will have less problems with algae growth. A pond located beneath trees should also have a skimmer box. The skimmer box is a mechanical filter that pulls the debris from the pond into the box so it can be easily removed. Waterfalls and Streams: If you plan on having a waterfall and/or stream be sure to place this so that it faces you in your favorite area. You want to be able to view and hear the waterfall and stream so designing them so that the water flows towards you is key. If your design incorporates a stream, you will want to create it in a winding and bending manner to give the illusion it was naturally created. Streams that have a straight path don't look as natural as a stream that meanders throughout the landscape. When building a waterfall, you want to keep in mind the height of your waterfall. I've seen too many people try to create a 7 or 8 foot high waterfall in the flattest yard imaginable and not be happy with the outcome. Create your waterfall with a natural looking berm around it so that it doesn't look manufactured. Creating the berm around the waterfall will tie it nicely to the overall project and will allow additional space for plantings. 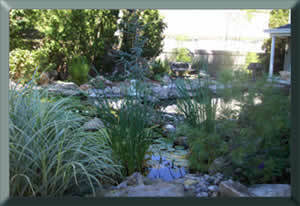 Final Note: When it comes to building a pond it is better to hire a professional. If you are a going to tackle this project on your own it best to hire a Pond Construction Expert for a consultation so they can give you a lot of tips and pointers so you don't run into any major problems.